Look at the picture below well. While it doesn’t seem to have anything horrible in it, it is easily one of the most horrific images depicting the humankind. 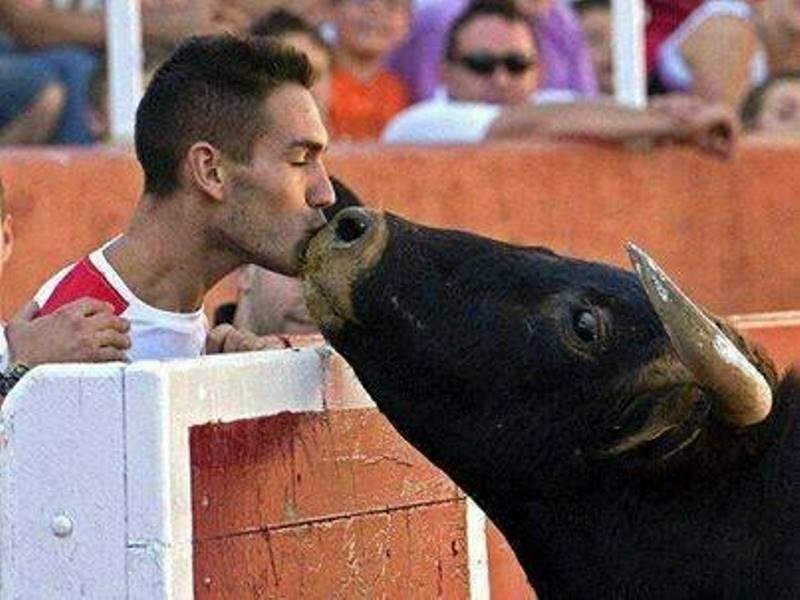 The picture was first printed in a Spanish newspaper captioned The kiss of Judas, it shows a bull, sent out in a ring to endure torture and finally, death, running up to his breeder, the only face which he recognises in this crowd maddened by the frenzied euphoria of this barbaric sport, the bull perhaps, in pain feels that his owner, the man who reared him since he barely learnt to walk would save him and so he reaches forward only to be kissed back by the man and sent back to his death. The picture depicts our hypocrisy as a species, we take pride in calling ourselves as civilized beings and yet we kill beings lesser to us for sport and entertainment, earlier similar rings were occupied by wild animals, the gladiators, the slaves and the savages and now they are occupied solely by animals. Some darn progress humanity has made!